I wasn't really going to write about this soup, because I didn't really start with a recipe, and I didn't expect it to be all that great. But it turned out to be one of the best soups that I think I've made all year. Plus, we're entering soup season. So why not share? 1. Start with a bunch of red stemmed kale, and strip out those woody stems. Rip each leaf into bite sized pieces. You should end up with a huge fluffy mound of kale by the time you're through. 2. 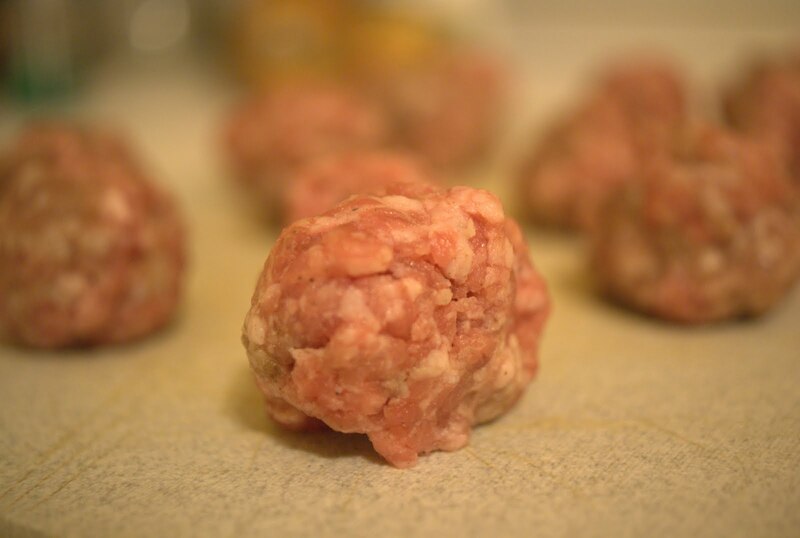 With about half a pound of ground pork sausage (not in casing), start rolling the sausage into little meatball looking things. We had some lovely pork sausage from a pork sampler that we had ordered back in spring from Jen and Pete's Backyard birds. The pigs were dispatched and our sampler became available a few weeks ago. The bag of sausage meat laid waiting for a spark of inspiration, but the bigger half impatiently opened it a few nights ago for a midnight snack, so I figured I'd better use it quick before it was all gone, or ::GASP:: it went bad. So sausage meatballs for the soup, it is. Sounds pretty darn good to me. 3. In a large dutch oven, throw in a tablespoon of canola oil and heat on medium until the oil shimmers and is ready. Throw in your meatballs, and give them a good toss. When all the meatballs are seared on all sides, and are pretty cooked through, remove them with tongs and set them on a separate plate. Add kale to your dutch oven. 4. Still on medium heat, throw about four diced up cloves of garlic, and then all your kale into the dutch oven. It should look like a lot. 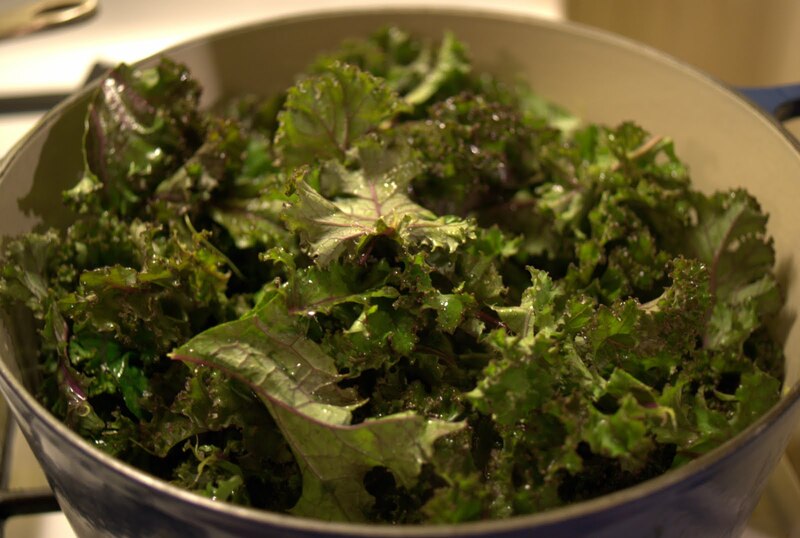 Toss the kale for the first couple minutes, add about a half teaspoon of red pepper flakes, and cover. 5. After five to ten minutes of stirring occasionally, when your kale looks a little wilted, add about five to six cups of chicken broth. I like a lot of broth in my soup, but you might like your soup chunkier. Use your judgement. Make this soup yours. After you've added as much liquid as you like (remember also that you're going to add in sweet potatoes and your sausage meatballs later on), cover the soup, reduce heat to about medium low, and let simmer forever and ever and ever. Longer it simmers, more flavor develops, but I feel pretty good letting it cook for about an hour, and just checking the heat to make sure everything continues on a gentle simmer. 6. 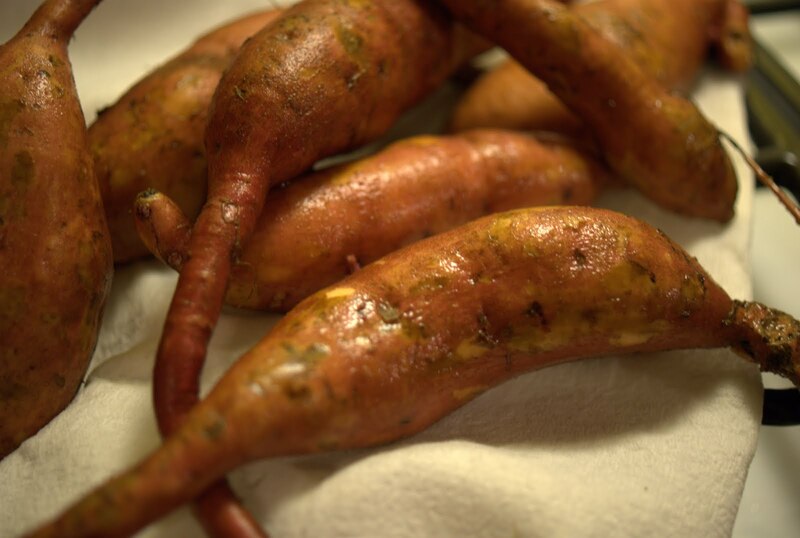 We picked up some really wacky looking sweet potatoes the other day from Kimball Fruit Farm at the Dewey Square Farmers Market. Admittedly, they were the ones left at the bottom of the barrel, which is why they were probably so weird looking. But I can't walk away from double ended sweet potatoes, can I? Plus, the ugly ones taste just as good. Trust me. Anyway, peel and cube your sweet potatoes. I had a little over two cups of sweet potatoes that I added to the soup. When you add your potatoes, turn the heat up to about medium, and again cover. It should take about fifteen minutes until the potatoes are tender depending on how big you cut them. 6. Taste your broth. Add salt and pepper to your liking. Add back your sausage, let it cook for another few minutes, just to make sure that the sausage flavor can again marry with the soup, and then serve. Like I said, I wasn't intending on writing about this, but it turned out to be so darn good that I couldn't help but share. 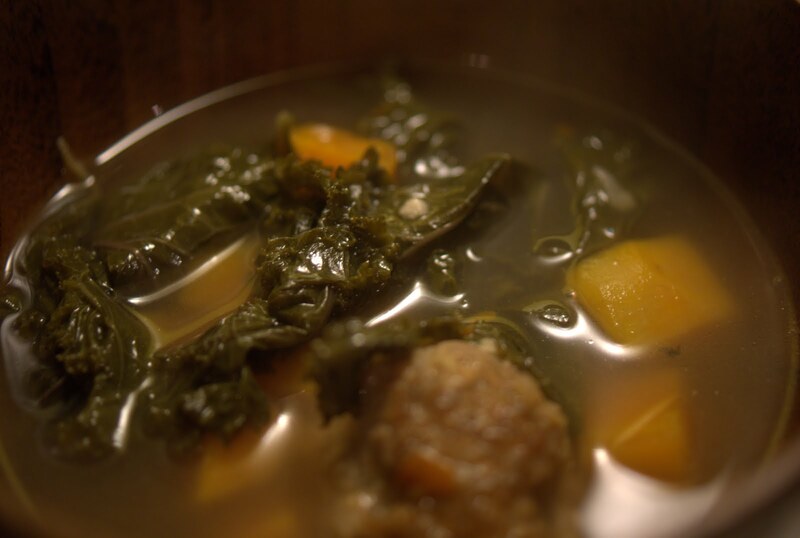 The earthy greens, packed full of vitamins, a well developed, slightly spicy and garlicky broth, and then that outstanding play between salty, zesty sausage (and Pete and Jen's is some of the best pork sausage I've ever tasted), and those incredibly sweet, soft and pillowy sweet potatoes. I think you'll find that the combination of kale, sweet potato, and sausage really should make more appearances on your dinner table.